Bergdorf Goodman window, June 2014. I do love an edited color palette in my Manhattan department store windows and of course Bergdorf Goodman is so very good at this! I particularly loved this window early in June, which was gorgeous in different tones of green and gray. I always go crazy for their Christmas windows—who doesn’t—but I do like their offerings other times of the year too, such as this one, when the window is stripped down in terms of background and it really is all about the clothes and accessories. I love the Rochas dress above most of all—the fabric is amazing!—and I like that the whole window got me thinking of paler shades of green and how beautifully they pair with dove gray and white. A stunning Oscar de la Renta coat. Don’t you love the different tones of green and silver in this Rochas dress? It also got me thinking of a nail polish I picked up last year that I think is so pretty in summer, Two-Fingered Salute by butter LONDON. It has gold and pink flecks in it instead of silver, but it has the same feel as the Bergdorf windows, showing an unexpected and lovely shade of green. Two-Fingered Salute by butter LONDON and the back paws of Tippi! Taken with flash.This is a gorgeous color but hard to capture in photographs! I don’t have a lot of green in my wardrobe but the Bergdorf window has me thinking I should add a bit more. Do you have a lot of green in your closet? Such a serene color palette, and very pleasing to the eye. The Oscar coat and Rochas dress were both unbelievable. I would stand outside the window in complete and utter aw. I love it when you show us windows in NYC, Jill. These soft shades of green are so peaceful and relaxing. Thanks for sharing...and have a wonderful week! I love the softer shades of green, as long as they're not yellowish. this soft green and gray is beautiful together. And your kitty's paws are adorable! I do like that shade of polish. What a lovely colour combination. I am going to try it. I have quite a few pieces in both colours. Green is one of the best colors for me as I have green eyes & dark brown hair. However not all shades - the lime greens, mint greens, no so much. Khaki's, olives, emeralds, teals - really work well. 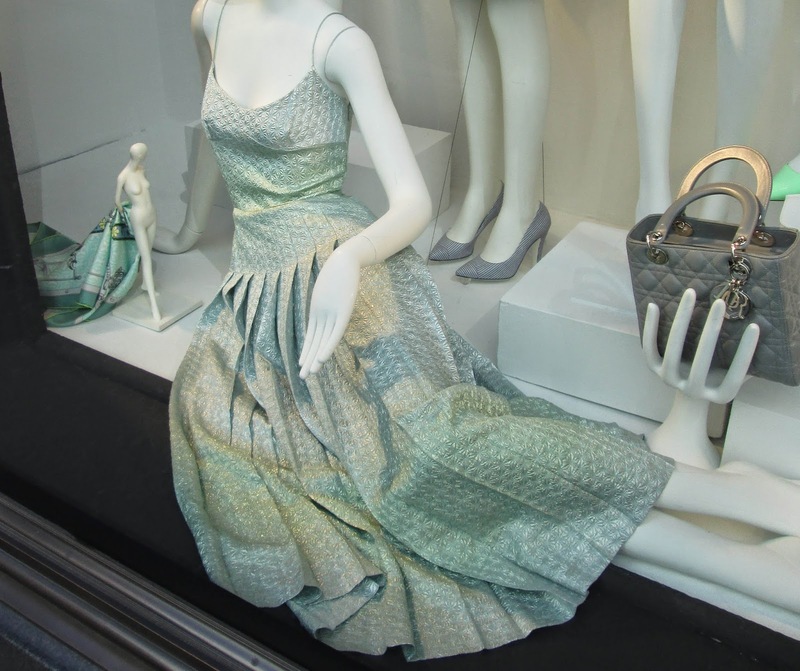 The silvery green dresses in the Berdorf windows are beyond beautiful. I will just have to go see the windows in person this week. Thank you for all the lovely comments, ladies, the BG windows always bring me such joy. I really love to share them with you! What a restful palette. I love watery greens and silvery greys. I actually do wear a lot of green, and decorate with green too. What a dreamy color story! Love your Butter polish .. and the cute kitty paws too!